She is the ocean ,she is the Life shaper, a black woman in tune with the universe, she is curious of her Life , her body, her existence and environment, a student of life, people and the universe, 5feet and 4inches tall, who loves Cooking, Travelling, meeting people, writing articles, and acting. A Black queen from Enugu state, 24years old in love with her root Mother Nature and peace of mind. She is Udeh Cherish Maduemenwa. 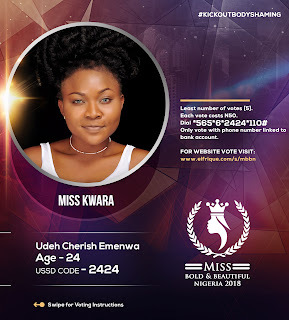 She is Miss Kwara state. 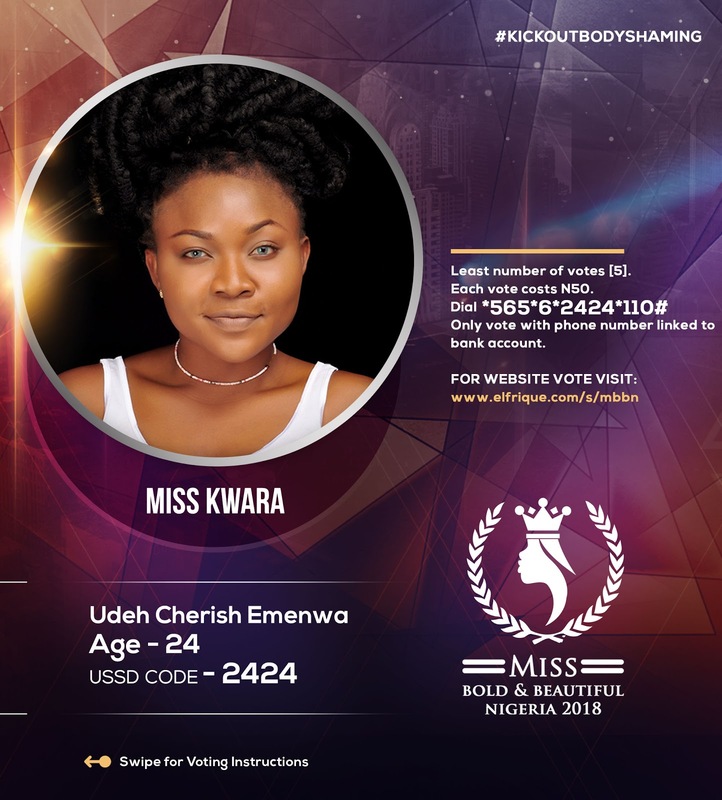 I will Love to be Miss Bold and Beautiful Nigeria 2018, because I have worked out a plan not just to market the Pageant to Contestants and Sponsors alone but I think Pageants like Miss Bold and Beautiful Nigeria gives us young women an opportunity to foray in the fields that we want to and forge ahead, be it Entrepreneurship, be it the armed forces, be it the entertainment industry ,be it Politics , it will give me an avenue to voice my choices and opinions, also I want to use it as my platform to Promote our educational system in Nigeria, Fight body shaming in our society, Social Projects which I will like to develop into a National Level because a crowned queen is a spokes person for diversity, who travels round the nation bringing Peace ,Love, Hope and empowering young ,old and everyone around her to be confident , happy and independent.